This recent addition to our hire stock has already proved very popular. As you can see, it looks great and the kid's love it. I'ts ideal for the younger kid's and can be hired out on it's own or with one of our quality Bouncy Castles or our Soft Play equipment. Due to it's size it can accomodate around 7 kid's at the one time. This Toddler Playzone is by far, one of our most popular pieces of equipment this year. It has a Ball Pool and Slide included and is ideal for kid's 3 and under. The Toddler's Soft Play is also one of the most sought after units we have at the moment. 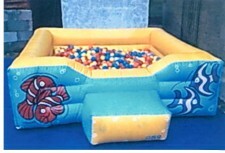 It's great for keeping the younger kid's entertained and is ideal when hired out with one of our ball pools. Why pay money to take the kid's to the expensive Indoor Soft Play, when you can simply enjoy the same party experience in the comfort of your own home or at a venue of your choice.